Chemicals which interfere with a mosquito's ability to sniff out humans have been developed by US researchers, according to research in Nature. 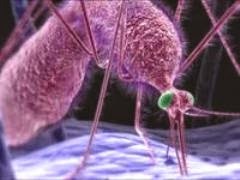 It is hoped they could be used to develop the next generation of mosquito traps and repellents. A UK expert said the discovery could be a "major step forward" if the chemicals were safe and cheap. Female mosquitoes use carbon dioxide in people's exhaled breath to find their next meal. They can detect minute changes in the concentration of the gas and track it back to a human breath. This knowledge is already used in carbon dioxide traps, but requires dry ice or gas cylinders - which mean they are rarely used in developing countries. Researchers have been looking for chemicals which can disrupt or confuse a mosquito's carbon dioxide sense. Scientists at the University of California, Riverside, tested smelly chemicals on three species of mosquito: Anopheles gambiae, which spreads malaria; Culex quinquefasciatus, which spreads filariasis and West Nile virus; and Aedes aegypti which spreads dengue and yellow fever. Between them these insects are thought to spread disease to half a billion people each year and cause millions of deaths. The researchers identified three groups of chemicals, which disrupt a mosquito's carbon dioxide receptors. One mimicked carbon dioxide and could be used as bait in insect traps, another prevented the mosquito from detecting carbon dioxide and the last group tricked the mosquito's brain into thinking it was surrounded by huge quantities of the gas - so it could not pick which way to go. Professor Anandasankar Ray, from the University of California, Riverside, said: "These chemicals offer powerful advantages as potential tools for reducing mosquito-human contact, and can lead to the development of new generations of insect repellents and lures. "The identification of such odour molecules, which can work even at low concentrations, and are therefore economical, could be enormously effective in compromising the ability of mosquitoes to seek humans, thus helping control the spread of mosquito-borne diseases." Carbon dioxide is not the only way mosquitoes can find their dinner however, as the smell of human sweat and skin can also be used. Dr James Logan, from the London School of Hygiene and Tropical Medicine, said: "Whilst this is an exciting study, the authors are yet to show that the chemicals are capable of protecting a human being from being bitten. "Although carbon dioxide is an important cue for mosquitoes, we know that mosquitoes respond differently to a trap releasing carbon dioxide than to a real human being, which releases a complex mixture of many attractive chemicals, heat, visual cues and moisture. "The key question is - do the 'response modifying odours' actually protect a human being?" The chemicals also need to be used at high concentrations, which could be hazardous to human health. The researchers say their next step is to develop safer chemicals. Dr Nikolai Windbichler, from Imperial College London, said work needed to be done to ensure they were safe and could be produced at low cost. He added: "These compounds have novel and desirable properties because they can confuse the mosquitoes' host seeking behaviour even when the substances are no longer present or the mosquitoes have left the area of application. "This, if realised, could be a major step forward and could protect large groups of people or large areas, something that is not currently feasible with existing repellents." Mark Stopfer, from the US National Institutes of Health, said the study offered "a promising line of defence."